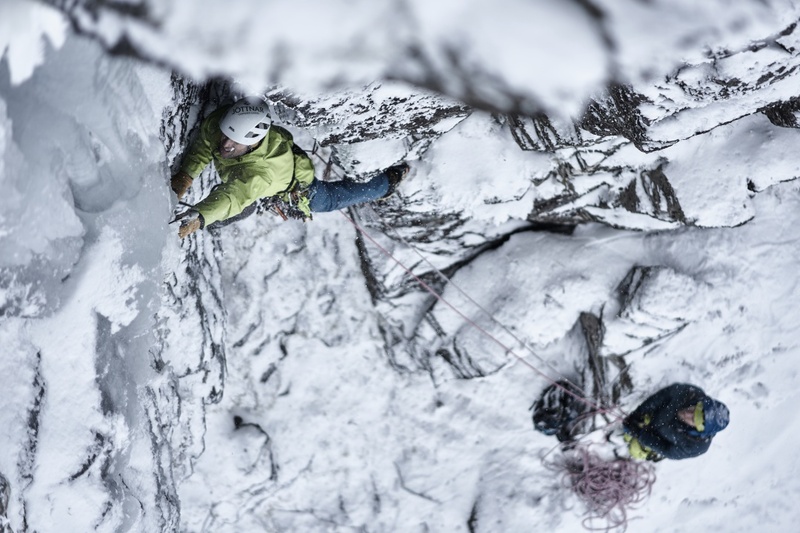 Winter climbing can be a challenging mountain sport to layer for. It has a combination of both highly aerobic approaches and technical pitches, followed by long stationary stints spent belaying. It's important to avoid excessive sweating as this will cause rapid cooling in sub-zero temperatures as soon as movement ceases. Do whatever it takes to avoid overheating, even if this means walking in to routes in just a base layer or walking more slowly. This will make a huge difference to your comfort throughout the day. The old adage of ‘be bold, start cold’ definitely holds weight. These are the foundation of your clothing system, and have two main jobs: provide insulation, and to transport sweat away from your skin (also known as 'wicking') to keep you dry and comfortable. They can be made from either synthetic or natural materials (such as merino wool). Synthetic base layers, such as the Erling, can have better wicking properties, and are often quicker to dry than natural wool options. Merino wool, such as our Hamr and Heimdall, on the other hand, has superior odour resistance and it also boasts better temperature regulation, ensuring that you neither overheat or cool too quickly. Base layer leggings are often a matter of preference, but when worn underneath hardshell trousers, comfort will be increased hugely. These provide most of the insulation while actively climbing, and also have a role to play in moving sweat further away from the body, by wicking it away from the outer surface of the base layer. These can take many forms, but the most common would be a fleece jacket, such as the Hemming or Magni. In exceptionally cold conditions a down or synthetically insulated jacket (such as the Thorsen or Elvar) can be a substitute. Depending on route and conditions, a pair of soft shell trousers (such as the Vali) can be worn on their own, or layered underneath a pair of hard shell trousers, such as our Vanir LTs, as part of a more comprehensive layering system. All our mid layers are treated with a Durable Water Repellent (DWR) finish to help light precipitation bead off. Hoods on mid layer jackets are a matter of personal choice, although they have the obvious benefit of helping keep the head and neck warmer. Our hoods are designed to be worn both over or under a helmet, giving greater flexibility. Mid layers provide most of the insulation while actively climbing and also have a role to play in moving sweat further away from the body, by wicking it away from the outer surface of the base layer. Often referred to as ‘hard shells’, these form the final layer of protection against the most severe weather. They feature waterproof-breathable membranes, such as our exclusive SKJOLDR™ fabric, in order to keep the wearer dry while allowing any sweat vapour to escape. All of our hard shell jackets, such as the Bergelmir or the Odin, feature hoods that can be worn over a helmet, but equally can be worn comfortably over a bare non-helmeted head. The Odin also features pit zips to help minimise overheating on the walk-in and out. All of our overtrousers (the Vanir salopette and Vanir LT trousers) feature 3/4 length side zips, to allow them to put on over boots during the day should the weather turn, along with built-in gaiters to minimise snow ingress. The Vanir salopettes are a better choice in very cold conditions, as the high bib adds a further layer of insulation to your core. 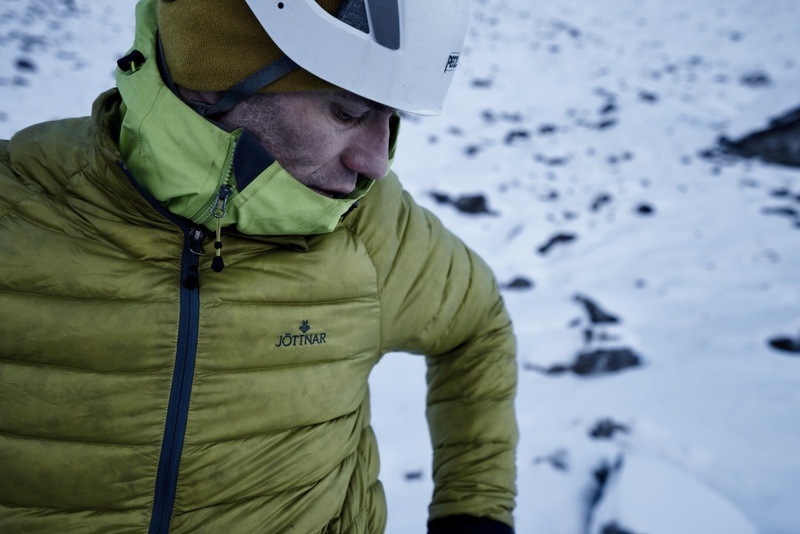 The belay jacket is a specialist piece of kit, and is generally only worn while belaying. This can be insulated with down or synthetic fills, with the final choice being influenced by the prevailing weather conditions. Generally, down is better suited to cold and dry conditions, as damp down loses much of its warmth. However, jackets such as the Fjorm are filled with hydrophobic down, which makes it far less susceptible to damp and will thus remain warm even when the jacket has become a little wet. Belay jackets should be bought oversized, as they are usually worn over the top of all the other clothing worn while climbing (it is best to measure while wearing all the clothing you are planning to wear, and then use our size chart to help you make your decision). The head, hands and feet are the most likely areas to become extremely cold, and they require a little extra consideration. Wearing a hat (or hood/helmet) will keep your head warm, and also reduce overall heat loss, which will help keep the other extremities more comfortable. Gloves are often awkward, as it is essential to find a balance between warmth and dexterity. 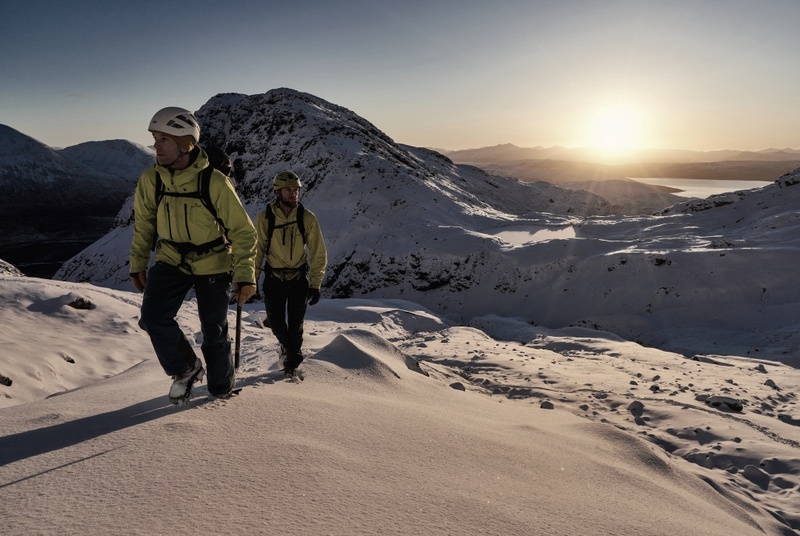 They can be split into approach, climbing and belaying; approach gloves can be light, whereas climbing gloves can be a little thicker and preferably waterproof (especially in Scotland or on wet waterfall ice). The best climbing gloves will feature more insulation on the back of the hand rather than the palm, as this gives insulation without impinging on dexterity. It is always worth carrying several pairs of climbing gloves on a route, and rotating between them to keep them dry. An inside dump pocket on a hardshell is the ideal place to store gloves, or alternatively tucking them down the front of the jacket when a harness is worn. Belay gloves should be oversized, to allow them to be put on and taken off easily, and preferably waterproof. Overall dexterity can be compromised here, as their primary purpose is to maintain warmth. Appropriate footwear, usually a four-season mountaineering boot, is the best way to keep the feet warm, and boots with built-in gaiters will generally be the best option. Also, wearing liner socks will help to trap more warm air around the feet, keeping them comfortable for longer.